Our TigerTurf Marquee series will blend perfectly with any natural surrounding. 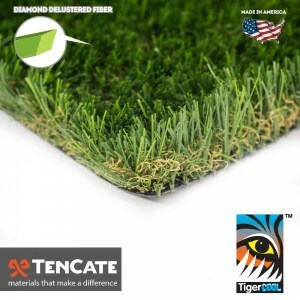 With its field and lime green colors and an added brown thatch layer, TigerTurf Marquee Series is recognized for its realistic look and feel. Our Marquee Series features a polyethylene diamond delustered grass blade shape making it the perfect option for lawn replacement, dog runs, patios, rooftops, balconies and more! Our Marquee Series provides turf options for moderate traffic, making it safe and durable. Each grass blade is made with a triple reinforced backing technology, delivering a superior product so that each grass blade will stand tall no matter the level of traffic. All of our Marquee products feature U.V. inhibitors as well as our premier TigerCool technology applied during the manufacturing process. 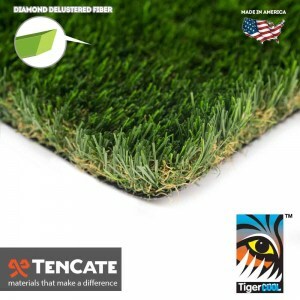 This ensures that the Marquee turf will never fade, while keeping a cooler surface temperature.